TOP 1 bread slice with 1 Tbsp. of the pizza sauce, two 2% Milk Singles, 1 Tbsp. of the peppers and 1 Tbsp. of the onions; cover with second bread slice. SPREAD outside of sandwiches with vegetable oil spread. COOK in skillet on medium heat until lightly browned on both sides. 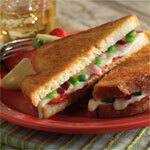 Great Substitute: To add whole grains to your diet, substitute whole wheat bread for white bread.